Justin Tillman is a beast. We have seen it in flashes and spurts but no one is poised to making a bigger leap on the court this season than junior Justin Tillman. Now, officially an upperclassmen, Tillman is passing down what he’s learned in his time at VCU to the younger, incoming players. We also talk about what kept him here at VCU after Coach Smart’s departure. Tillman prepares us for a new and improved Jonathan Williams who he expects to be dunking on people and throwing lobs. 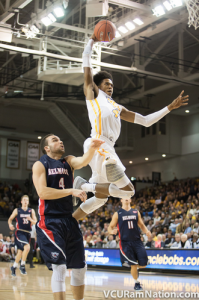 Enjoy the interview with one of the most humble VCU players who lets his play on the court do all the talking. Matthew – your card was declined, so we were unable to process your monthly subscription. Please update your card information and we can ensure that the subscription is re-enabled. I’m told that I’m signed in and then am sent in a circulation need to sign in message to access the Tillman video. My subscription is goose until December. Auto correct got me. I typed circular and good..